More than 6000 sites are powered by Getsocio. Visdeal.nl is the simplest way to obtain quality fishing products in Netherlands, Belgium, Germany and United Kingdom with high discounts. Supreme quality of fishing products is not the only highlight of Visdeal.nl - they put strong emphasis on support and service. Clients can always reach out to them and get their queries addressed quickly. The Got Spot offers the best daily discounts for Central Illinois and the Delmarva Peninsula. Great deals on restaurants, spas, golf, family fun, gifts and more every day up to 98% Off. Special Offers for UIUC, UofI, and Illinois State Students. NorthShore Plus features only the best daily deals: Steep discounts on the best the North Shore has to offer. That trendy new restaurant people are just starting to talk about? Give it a whirl at up to 90% off! Save enough on a cute pair of shoes to buy a second color. Treat yourself to a luxurious spa experience at a fraction of what others would pay. Score great tickets to hot local events at even hotter prices. Expect premium deals from premium merchants at exclusive NorthShore Plus prices. 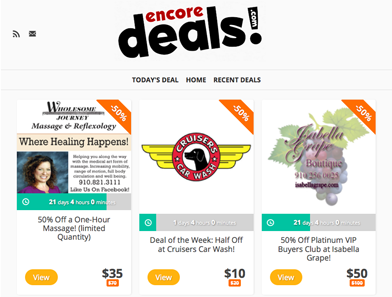 encore Deals! provides access to exclusive daily offers at the best places to eat, exercise, shop, and relax in the Port City. Support local businesses! The idea for Greg’s Text started in the summer of 2011. It started with the idea to share great same day only specials for people’s favorite restaurants the most effective way possible – a text! Now there are into offering so many great deals on much more. Half Off Today provides access to highly discounted deals on tours, vacations, flights, car rentals. Pick up your destination, dates and start saving money! Lifesadeal provides access to exclusive offers at the best places in the customer area. 50-90% off top activities and products. 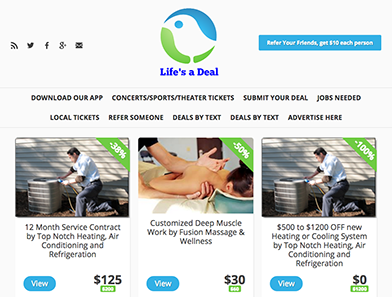 Lifesadeal regularly features offers from selected trusted local businesses. From sweet treats and yoga to the best restaurants and shops in town, they got you covered! Their Mission is to connect local commerce, increasing consumer buying power while driving more business to local merchants through price and discovery. features daily hot deals on spas, beauty salons, restaurants, getaways and everything in between in Toquay, the United Kingdom. A voluminous business directory collected by TorbayiVoucher, allows them to hand-pick and serve great deals at ridiculous prices. Fish spa, beauty treatments, nightlife events, meals all get delivered straight to the subscribers' inbox. offers the best daily deals on tactical, military and outdoor gear with 50%-90% discounts across the site and all over United States. Each day they offer an awesome deal on great gear from brands the customers trust like Smith & Wesson, SOG, Ka-Bar, Kershaw, Gerber, UZI, Humvee and more. No question goes without an accurate and helpful response from hard-working customer service team. is a live demo site, featuring mockup deals on restaurants, spas and various fun activities in New York, Los Angeles and Palo Alto. Sign up and wander around to see what kind of daily deal web site you can build using Getsocio.